Here's a Jord Dusat protomolded figure. The assembled view is not too extraordinary. When taken apart, however, the piece becomes a bit more interesting. These early injection-molded figures, while they are made from low yield metal molds, retain the simplistic construction found on most hardcopies. 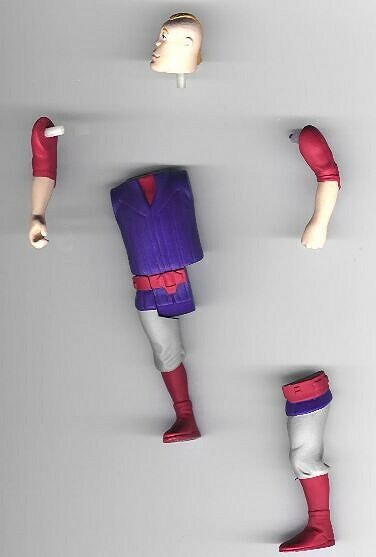 The limbs are attached via pins, which are simply extentions of the larger plastic pieces. It's pretty tough these days to find an internal first shot. But by the dwindling years of the Star Wars lines, Kenner appears to have been using them frequently for many pre production tooling applications.